Solid block sculpture containing cast Buddah in the finest optical quality glass. This is a 'protection' Buddah with raised hand and seated in the lotus position. Conveying courage in the face of fear this Buddah symbolizes meditation as a protective force. 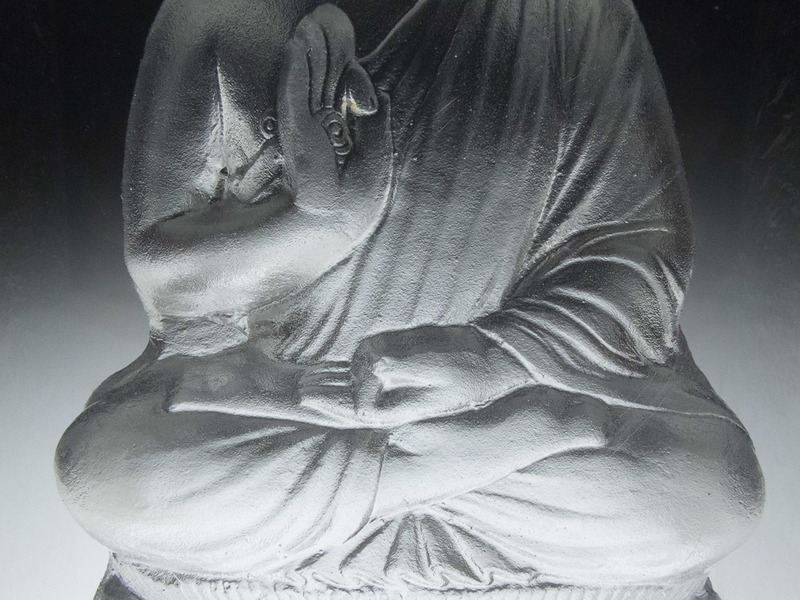 Beautiful negative cast Buddah has beautiful detail, textured detail in the mold cavity, and glue chipped sides. Large sculpture with an impressive presence. Lovely art sculpture and makes a great gift or decor item for those interested in Eastern Philosophies. Hand cast and finished by master glass artisans in our Warren RI studio. Notes: stunning large cast Buddah in optical quality glass. Negative casting, brilliant clarity, glue chipped sides. All Buddah sculptures are hand cast art pieces and therefore will show variations, minor imperfections, and the like. These are not considered flaws and are the unmistakeable character of hand crafted pieces. No two pieces are ever exactly alike. All dimensions are approximate.